If you see me out and about on any given day most likely I am wearing leggings or shorts and some kind of fun athleisure sweatshirt. Today I am sharing 10 athleisure sweatshirts you need! Cheers: This is actually sold out but they have tons of other cute ones under $15! I am pretty sure this project social tee sweatshirt is the softest thing in my wardrobe! SaturYAY indeed with this soft and cute sweatshirt that would look great with leggings, shorts, or jeans! Late night Amazon shopping sometimes turns into random cute sweatshirt finds like this one. 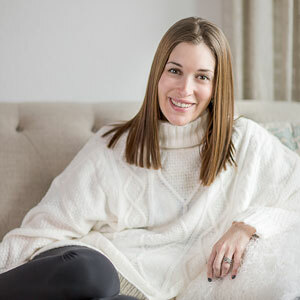 I love this sweatshirt from Anthropologie that is currently 50% off! The cutest one to throw on and head to a coffee shop. I love this adorable Rose sweatshirt that has been on my wishlist for quite a while and I think I may pull the trigger soon! I got this I heart coffee sweatshirt from Target several months ago and lived in it all winter! So cute and under $20! This girl power sweatshirt is such a cute cropped find from Nordstrom! I love the message. Sport your favorite blonde or brunette look with these sweatshirts. Do you have any favorite athleisure sweatshirts? Are you more of a loungewear person too? Also linking a few other favorites below! I love that this style of clothes is a thing because it’s what I live in so for once I’m fashionable. I love that there are multiple coffee inspired shirts! I SUPER LOVE sweatshirts!! They work in any season! These look so comfy! I like items like this but because i’m a +size they never seem to look good on me, haha! I’m more a loose tee kind a girl! These all look super comfy and w/ a relaxed feel. I hate a sweatshirt that is bulky and stiff feeling/looking. The coffee one would be my pick. These are all pretty awesome. I very partial to the coffee theme! Lol! Girl, these are so cute! Great selections! My favorite has to be the Cafe Societe sweatshirt. I’m such a homebody, I need this in my life. I love the style of the longer sweatshirts. So cozy looking! Sometimes it’s nice to wear a cozy shirt, especially when lounging at home. I love the I love coffee shirt. I do love coffee and I love the length of it. I see quite a few I’d wear! Wonder if they have sizes/styles for men? the weekend one is actually mens! Oh my gosh! They’re so cute! I would definitely wear a coffee one, for sure! These look like a perfect thing to wear for a lounging weekend day. But they look good enough to go out shopping or walking. This would be my daily outfit of choice if I could get away with it. Ooh lots of really cute sweatshirts here. So comfortable! They are all so comfortable looking. I love the one from old navy. I buy many of my athlesuires from old navy. They have great selection for +size. I love oversized sweatshirts. Let the online shopping habit begin…again! Love your picks! I think the “weekend” one is my favorite. 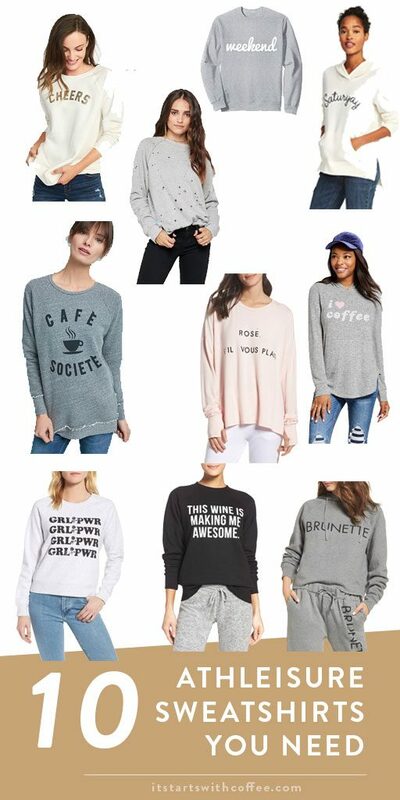 i want all of them…waiting for a day when yoga pants and sweat shirts are totally okay EVERYWHERE. I saw a girl with the brunette shirt on the other day and I thought so cute! I need every one of these to combat this “spring” weather! Such cute sweatshirts! I love that saturyay one! How cute are these! You are right- I do need them all. Such great additions to the closet. These are all so cute! I think my favorite is the pink one! Looooove the Anthro one! Such cute finds. oh my goodnesssssss – these are so chic and cute!